Kukup is the name of a small island in Malaysia. 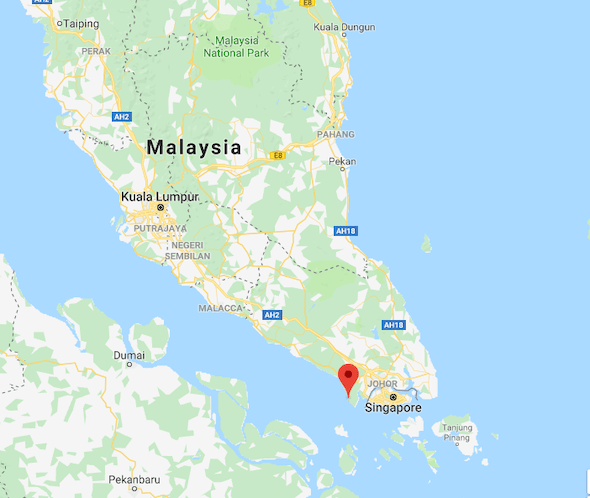 The island is precisely located in Pontian District, Johor, Malaysia. From its geographical side, Kukup Island is located about 1 km offshore from Johor mainland, while its width stretches up to ​​6,472 km2. As a growing tourist destination in Malaysia, Kukup Island is visited by tourists who want to checkout its natural beauty. With a combination of crystal clear blue sea and golden sand, Kukup Island offers an awesome location to visit. What to Do in Kukup Malaysia? When To Visit Kukup Malaysia? How to Get to Kukup Malaysia? Where is Kukup Malaysia on the Map? Talking about the history behind Kukup Island, the island actually holds a quite unique story. Initially this island is a remote hinterland in Malaysia. There’s nothing interesting that makes it special. Until in 1990, scientists and researchers became interested in the unique biodiversity that existed on the Kukup Island, so the island began to be used as a habitat for the conservation of rare biodiversity in it. As a result, based on the Johor State Park Corporation Enactment finally Kukup Island was changed into a national park, which is precisely on March 27, 1997. Subsequently in January 2003, based on the RAMSAR Convention in Geneva, the island became a wetland of international importance or RAMSAR site. The island itself is predominantly covered in mudflats and mangrove, with various wildlife can be found there such as wild boars, monkeys and mudskippers who inhabit the island. Relating the natural beauty of Kukup Island, this region became one of the best tourist spots in Malaysia. If you planned to spend your visit on Kukup, there are many things you can do when visiting Kukup. If you are curious about what things to do in Kukup Malaysia, here are some information regarding activities to do when going to this island. Likewise with the Kukup Johor Island National Park which is one of the widest uninhabited mangrove islands in the world. You can imagine the unforgettable adventure that you can get on this mangrove island. With a stretch of beautiful mangrove island and blue coastal area that surround it, you can take a boat ride to travel the Kukup Island. Unspoiled natural beauty combined with the hospitality of the people will impress you to come, again and again. While cruising the island by boat, you can also enjoy a culinary tour in the rural area of ​​the Kelong area. Culinary tour has become another popular attraction of the Kukup Island in Malaysia. Various special seafood menu served such as muscles, crabs, prawns and processed fresh fish. A variety of deliciously prepared seafood restaurants will welcome you. In addition to enjoying various delicious seafood served here, these restaurants are also very cheap. You will be happy to enjoy it without need to worry about the bill. 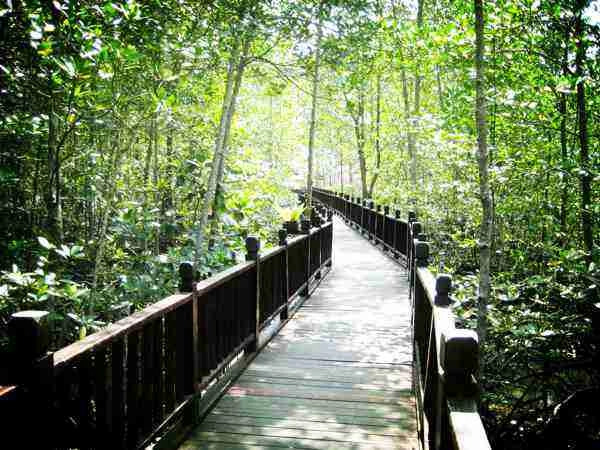 In addition to surround the island by boat, you can also take a boardwalk to enjoy the other side of the Kukup Island. 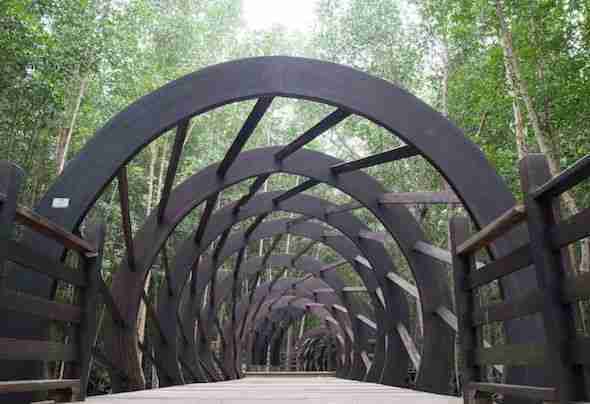 A boardwalk of 800-meter long will take you to enjoy the beautiful island atmosphere. The boardwalk will take you along the eastern region of Kukup Island. To roam the eastern region of the island with a boardwalk of 800 meters, you need less than 1 hour. Throughout this journey, you will be treated to the native habitat of Kukup Island and the beautiful mangrove forest that covers the island. At the end of your board walking trip, you can also enjoy the scenery of Kukup Island by climbing the Aery. 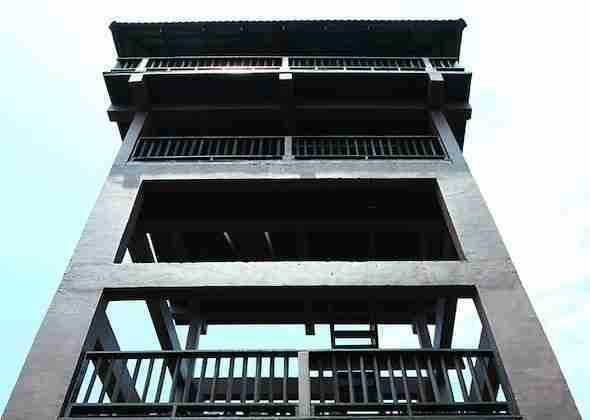 At the end of your board walking trip, you will find a 30-meter-tall tower. You can enjoy the view. To enjoy the real Kukup Island with its original natural feel, it seems that you need an awakening activity in the form of a momentary stay on Kukup Island. This can be realized by spending a few nights there. There are various accommodations and hotels that you can choose. You can choose your own type accommodation, whether it is cheap or exclusive with a variety of facilities. Whether you need a place that is special designed for backpacker or exclusive and luxurious, all are available. You can book online all the accommodation through the travel sites. It would be an incomplete trip when traveling to Kukup not go shopping. You can go to the town center in Kukup area to buy various souvenirs typical of Kukup Island, Malaysia. There is also a variety of dried seafood that you can bring home for your family. Everything is very distinctive and original. Kukup has a tropical climate, bringing year-round hot and wet weather to the island. Kukup has 2 seasons, dry season and wet season. Dry season is between November to March with with temperatures averaging around 30-35°C and at night can be around 29°C. Wet season is between April to October with with temperatures averaging around 25°C. Its is also know as rainy season especially between September and October when it can rain very heavy. In Summary the best time to visit Kukup Malaysia is if you are looking for good sunny weather, then it’s the dry season between the months of December to February. If you are looking for bargains on discount tours and hotels then the wet season it the best time to visit Kukup. There is a decent selection of ways to get to Kukup. There is no airport in Kukup. The most popular way to get to Kukup is by bus. Buses are available to take people to Kukup from all over Malaysia and Singapore. Private taxi’s are another great way to get to Mersing. Taxi rides are easily available from Johor Bahru, Melaka and other towns around Malaysia. The cost can vary depending on where you are travelling from and off course the driver. I have been asked where is Kukup Malaysia on the map. So I added picture shown where is it. Kukup has very limited and very few guest houses, hostels and hotels. Here are a few places to check out and give you an idea of what is available in Kukup if you are planning to visit Kukup. 10 km from Tanjung Piai National Park, Hotel Tong San is situated in Kukup and provides air-conditioned rooms. Featuring a 24-hour front desk, this property also provides guests with a restaurant and free WiFi. All guest rooms in the economy hotel are equipped with a flat-screen TV. Featuring a private bathroom, some rooms at Hotel Tong San also have a balcony. Finally, those are some of the activities you can do when you are on a visit to Kukup Island, Malaysia. These activities are full with the nuances of natural adventure because Kukup Island presents a natural tourist sensation for lovers of true adventure. And that’s it for now! 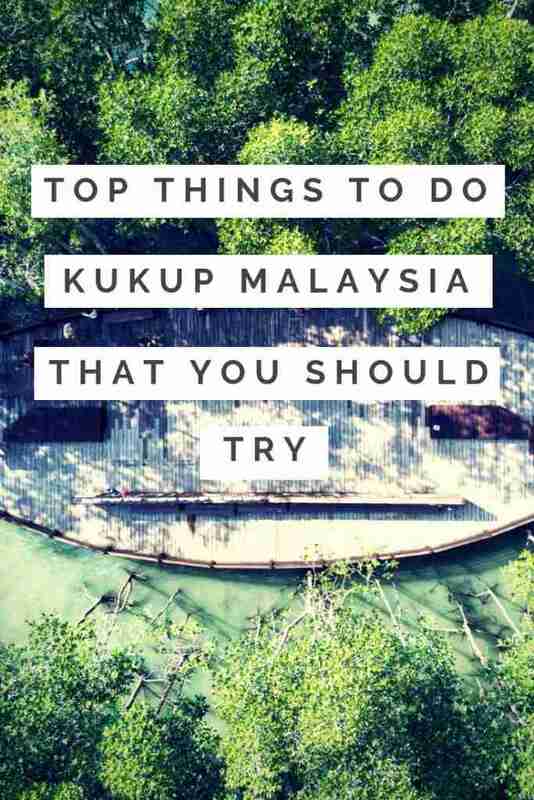 I’d love to know if this guide on the things to do in Kukup Malaysia has helped you. Let me know if you have any questions and let me know if you go too. Are Tuk-Tuks Safe to Use in Thailand and What They Look LikeHow To Prevent Mosquitoes From Biting You While Traveling?